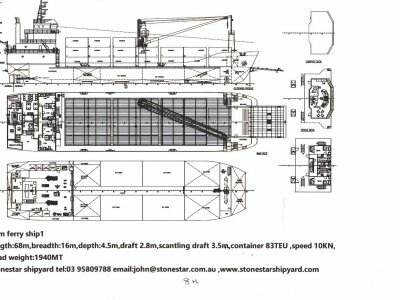 DWT 1940 tonne 68m barge /ferry Front ramps, can carry 83 TEU containers, beam 4.5m, draft loaded 3.5m, speed 10 knots, Built in China by Stonestar Shipyard, who employ 300 for timely cost effective builds, and drydock forgenrl maintenance. Full specs available upon application Price indicative . 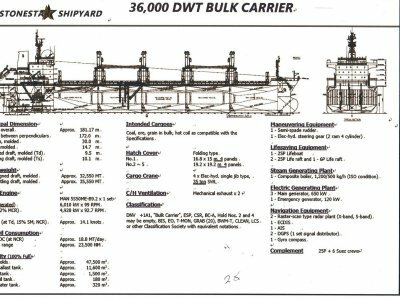 . .
189m 58,000 DWT Bulk Carrier. Suitable for Coal, ore, bulk grain, etc. 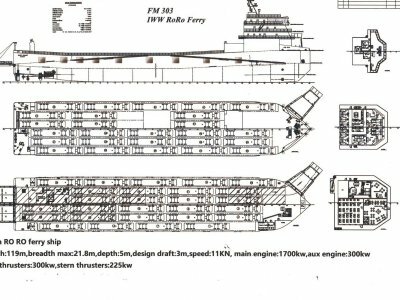 Main engine, 9480kw MAN, cruise speed 14.5 knots. 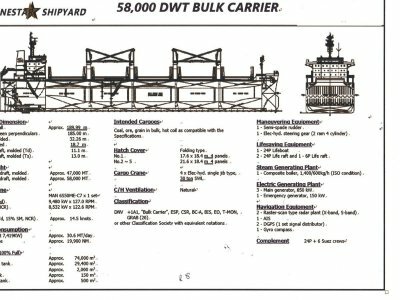 Classification DNV +1A1,"Bulk Carrier", ESP, CSR, BC_A, BIS, EO, T_MON< GRAB (20) or other classification society with equivalent classifications. 3 x 650kw gensets . . .
181m LOA bulk crrier, suited to coal, ore, grain in bulk as sutable to the specifications. 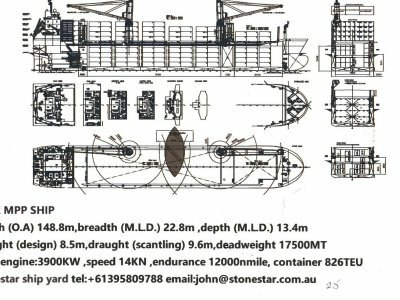 Moulded breadth, 30m, designed draft, 9.5m, scantling draft, 10.1m. Deadweight, at scantling 35,550 MT. Main engine, MAN 5S50ME-89-2 x 1-----MCR (derated) 6010kw @99rpm. NCR (825 MCR) 4928kw @92.7 rpm Cruise . 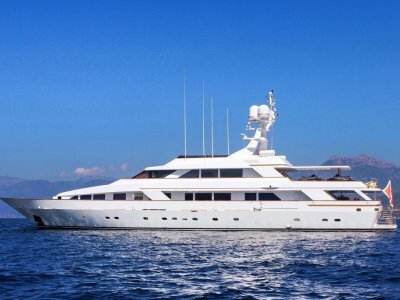 . .
New ship constructed by Lonestar Shipyards, China. 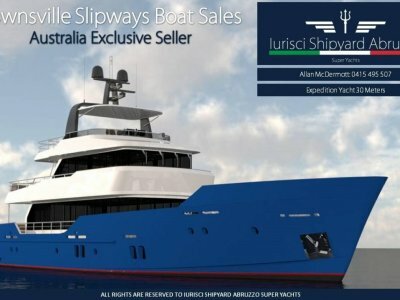 148m LOA, 22.8m wide, moulded depth 13.4m, deadweight 17,500 metric tonnes. 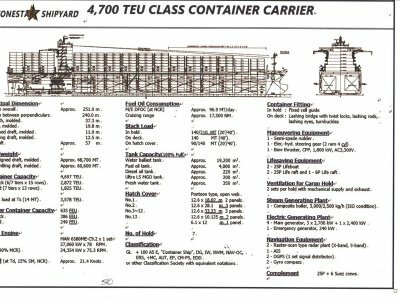 Main engine 3900kw, speed 14 knots, cruising range 12,000 nm, container 826TEU. Indicative price subject to change with buyers changes to specifications. Lonestar . . .
NEW SHIP, 129m approx length OA, chemical tanker class IMOType 2, tier 2. 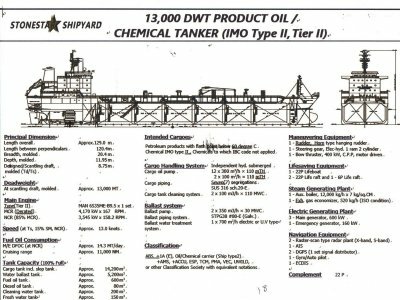 Intended cargoes Petrolem products with flash point below 60 degrees C, Chemical IMO type11, chemicals to which IBC code is not applied. 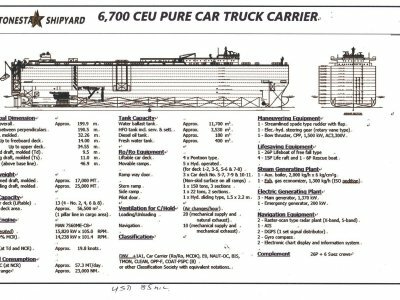 Classificication, ABS +1A (E), Oil, chemical carrier (Ship type 2) +AMS, +ACCU, ESP, . . .